Binding can be a divisive topic in the quilt world: some people love it, some people loathe it. But most quilts aren't complete without it, so in August we examined several methods and techniques to get it done. Armed with a slew of samples and some stunning antique quilts, Karen Downer walked us through the finer points of finishing quilts. If you're a fan of Universal needles, Karen implores you to choose something more specialized for your task at hand. She prefers Microtex (Sharps) needles for piecing because they have a very slim point, which helps your machine create precise, straight stitches. Use the right needle for the job! And check out Karen's pill-box presser foot storage system. For quilting and binding your work, try a Quilting or Topstitch needle. Quilting needles taper slightly to a rounded or "ballpoint" tip, which separates fabric fibers instead of piercing them. Topstitch needles have an extra long eye, which helps prevent thread breakage. A walking foot or the dual-feed feature (available on some sewing machines) can be a game-changer when it comes to binding and finishing. Each ensures the three layers of your quilt—and the multiple layers of binding fabric you're adding to it—move through the machine at the same rate. And if you're able to switch to a straight-stitch foot and needle plate, Karen suggests you do so. These help prevent your fabric from sinking down into the machine, and they can reduce puckering. They also support your fabric as the needle travels through it. Just don't try to do a zig-zag stitch while either one is on your machine, or you'll break a needle and possibly damage your fabric. Is your quilt going to hang on a wall? Will it be washed frequently? Do you want the binding to fade into the background, or should it be a prominent feature of the quilt? Do you desire durability? The answers to these questions (and others) will help guide your decision on which binding and finishing techniques to use. If you go the traditional route, and you want your binding to last as long as the quilt, Karen encourages you to use the double-fold method rather than the single-fold method. It's stronger and more durable, especially if you cut your binding fabric on the bias. Choosing a binding fabric that is a high contrast to the rest of the quilt can pull your eye away from the design. Karen says it also screams, "The quilt stops here!" But a low-contrast binding, or a binding that matches your background fabric, encourages viewers to focus on other aspects of the quilt. If you go the non-traditional route, Karen shared tips for faced bindings, faux piped bindings, flange bindings and more, and she gave us several great sources for additional information. Members can access those by visiting the Member Resources page. Check out the design for our submission into the 2019 QuiltCon Charity Quilt Challenge. 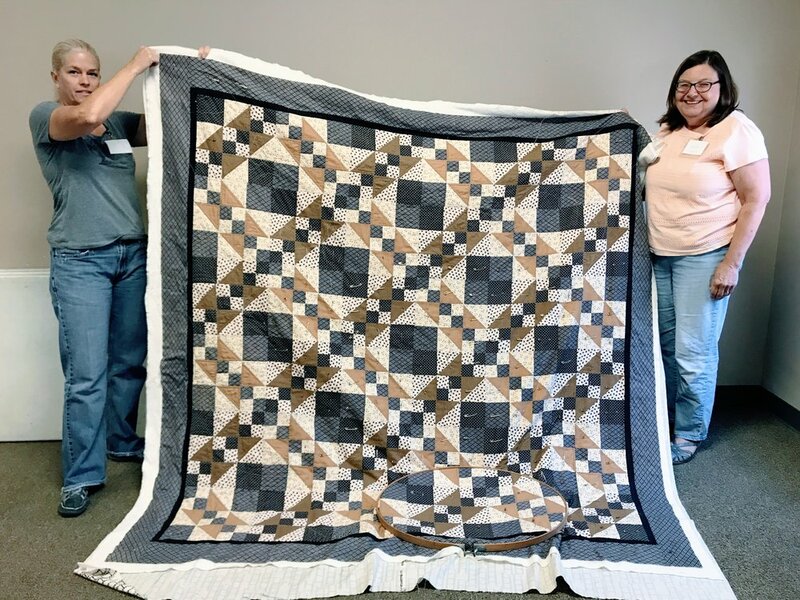 ChattMQG's design for the charity quilt challenge was developed by Mary Keasler, Jean Larson, Kelly Spell and Audrey Workman. Mary Keasler, Jean Larson, Kelly Spell and Audrey Workman created the design. It was inspired by an antique basket quilt featured in the book The Quilts of Tennessee. The finished quilt won't look exactly like this, but the rough mock-up gives you a good idea of what we envision for the end product. Our offset, modern basket quilt will be roughly 70" x 90" when we're finished, and it will feature lots and lots of tiny strips. 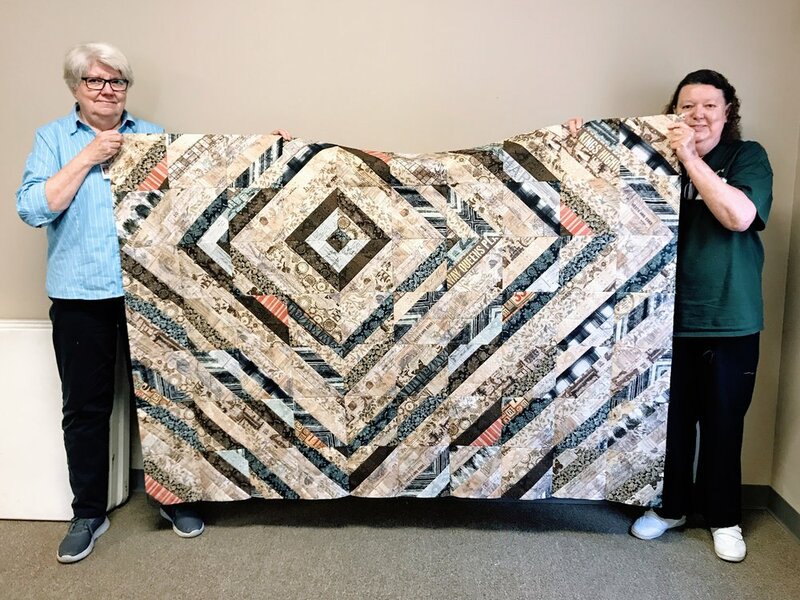 Mary, Kelly, Beverly Herron, Patti Ann Smith and Martha Steele cut those strips earlier this week, using fabric donated from guild members. Twenty kits will be handed out at our September meeting. Beverly Herron, Patti Ann Smith, Kelly Spell and Mary Keasler assemble kits for guild members.